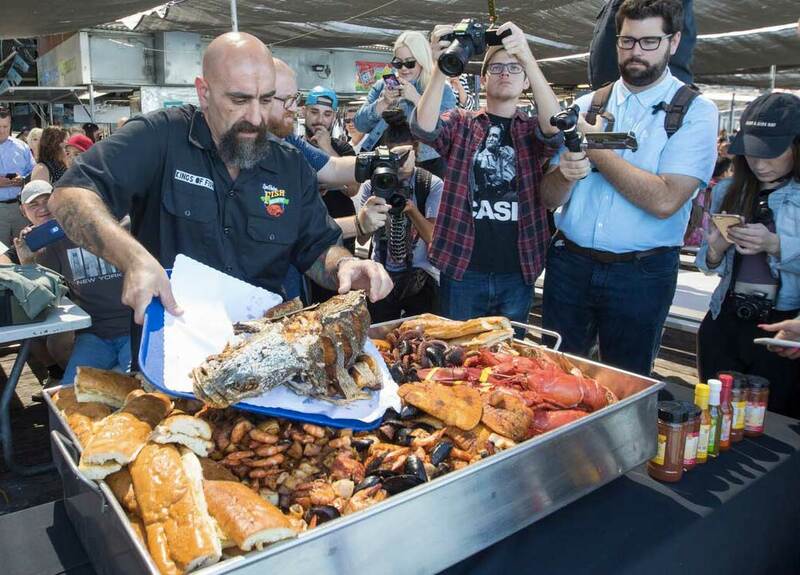 A few months ago, FOODBEAST broke the internet after revealing to the masses San Pedro Fish Market’s now world famous Seafood Super Tray, which received more than 30 million views online. 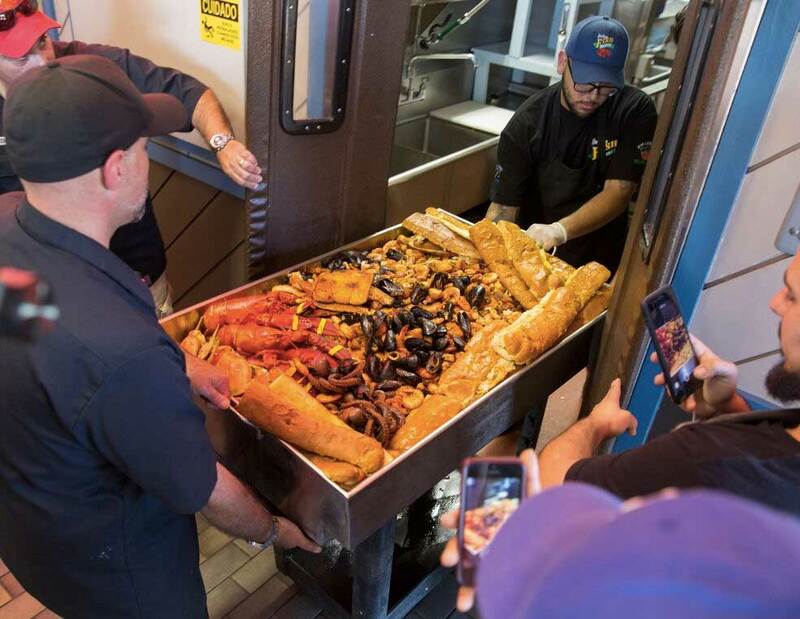 The virality of this colossal seafood tray actually shut down freeway off-ramps into the Port of Long Beach, with "tens of thousands" of people making their way out to this legendary family-owned seafood eatery to try a Super Tray of their own. 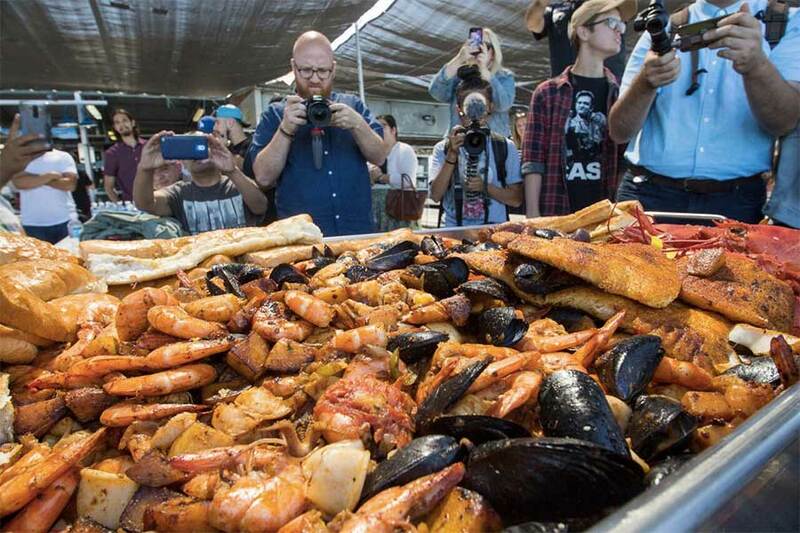 Capitalizing on the success of the previous Super Tray, and to celebrate the premiere of Kings of Fi$h Season 3, FOODBEAST and Corona invited some friends and family to the San Pedro Fish Market for a special event — the unveiling of a new Super Tray XXXL. Weighing in at more than 100 pounds, the Super Tray XXXL broke nearly every neck in attendance on the crowded water-front patio. Stacked to the brim with lobsters, crab, along with more than 10 different types of locally caught seafood and seasoned to perfection with San Pedro Fish Market's signature spices, the XXXL Tray is a sight to behold for anyone with a formidable appetite. The Super Tray XXXL is the equivalent of a golf-cart stuffed with seafood, ready to knock out 18 holes of hunger in one trip. This overflowing tub of seafood is literally rolled to your table and includes large shell shrimp, black mussels, Dungeness crab, halibut, calamari, large sea scallops and East Coast whole Maine Lobster. This massive feast also features tomato, onion, peppers, red potatoes, and warm loaves of the market’s famous garlic bread. To put things into perspective, this behemoth can easily feed between 80 to 100 people. So, if you and 100 of your closest friends think you can put a dent in one of the most insane seafood platters ever, you better let San Pedro Fish Market know you're coming. The new Super Tray XXXL will run you minimally $1200, and depending on the fish, can cost over $3000 (like ours did). Mike Ungaro, Principal of San Pedro Fish Market explained that there's a bit of preparation time to ensure availability for a platter of this size. If you're looking to feed an army, the restaurant recommends calling at least three days ahead of time so they can gather the perfect tray of fish, as well as add any modifications and special requests that need to be accommodated. Summer has just begun, which means there’s plenty of time to get the seafood squad together for some Super Tray XXXL savagery. So, start sending out your invites, and prepare for long summer nights at San Pedro Fish Market with the Super Tray XXXL, Corona Extra on draft, and perfect views of the water.